string(1013) "Resource Centre > Uncategorized > EICC Code of Conduct"
The Electronic Industry Citizenship Coalition® (EICC®) Code of Conduct establishes standards to ensure that working conditions in the electronics industry supply chain are safe, that workers are treated with respect and dignity, and that business operations are environmentally responsible and conducted ethically. Considered as part of the electronics industry for purposes of this Code are all organizations that may design, market, manufacture or provide goods and services that are used to produce electronic goods. 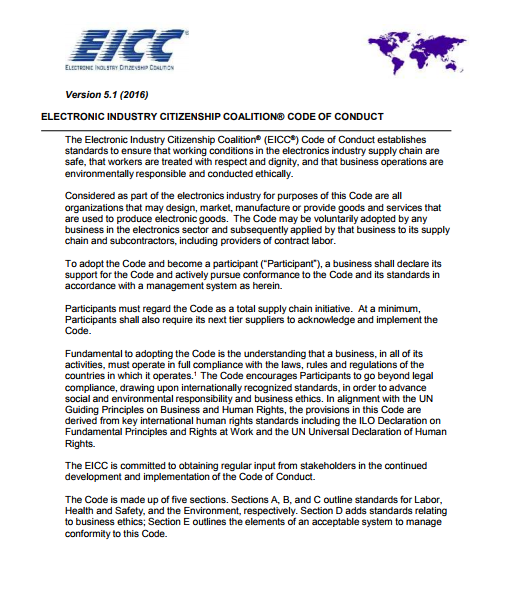 The Code may be voluntarily adopted by any business in the electronics sector and subsequently applied by that business to its supply chain and subcontractors, including providers of contract labor. To adopt the Code and become a participant (“Participant”), a business shall declare its support for the Code and actively pursue conformance to the Code and its standards in accordance with a management system as herein. Participants must regard the Code as a total supply chain initiative. At a minimum, Participants shall also require its next tier suppliers to acknowledge and implement the Code. Fundamental to adopting the Code is the understanding that a business, in all of its activities, must operate in full compliance with the laws, rules and regulations of the countries in which it operates. The Code encourages Participants to go beyond legal compliance, drawing upon internationally recognized standards, in order to advance social and environmental responsibility and business ethics. In alignment with the UN Guiding Principles on Business and Human Rights, the provisions in this Code are derived from key international human rights standards including the ILO Declaration on Fundamental Principles and Rights at Work and the UN Universal Declaration of Human Rights. The EICC is committed to obtaining regular input from stakeholders in the continued development and implementation of the Code of Conduct. The Code is made up of five sections. Sections A, B, and C outline standards for Labor, Health and Safety, and the Environment, respectively. Section D adds standards relating to business ethics; Section E outlines the elements of an acceptable system to manage conformity to this Code.